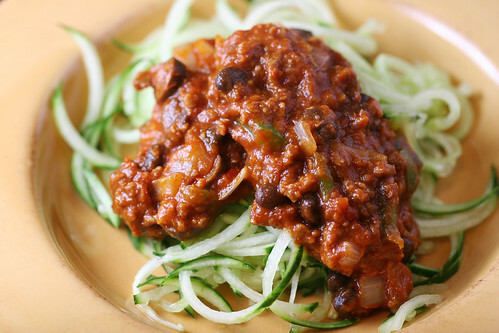 Michelle Meals: Oops, Cucumber Noodles. I was surprised by the exceptional girth of my zucchini when I bought it, especially given the fact that zucchinis have been shrinking consistently since the end of summer. But I didn't think much about it until I sliced it in half tonight, and discovered -- oh. It's not a zucchini. It's a cucumber. In the past I have relied on signs and gut feelings to tell the difference between zucchinis and cucumbers. Of course a little internet image searching reveals one particular difference I failed to take note of before: zucchinis have a stalk at one end. 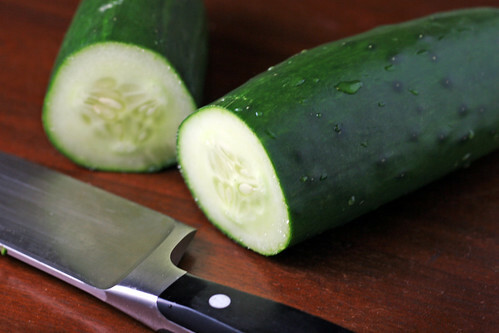 Cucumbers are rounded at both ends. Cucumbers also tend to have a filmy coating, according to this handy site (which I did notice while buying the cucumber, but only thought, hmmmm what's this new pesticide they're using; I'll have to wash this one extra well). But anyway. The delicious pasta sauce was ready to go (made from Classico Tuscan-Style Olive & Garlic sauce that was on sale, plus onions, green pepper, black beans and veggie ground round). And so I just tried to make noodles out of the cucumber. It didn't not work. And it didn't taste TERRIBLE. But, the texture and flavour of cucumber is a little too cold, wet and bitter (is bitter the word? Well, the flavour is the kind of flavour that needs things like feta cheese, tomatoes, red onions and black olives to offset it) to want to try that again. BUT maybe I will try making cucumber noodles again when I feel like making a fancy Greek salad. I boiled some macaroni to eat the rest of the sauce with. "I'll have to wash this one extra well." HAHA. 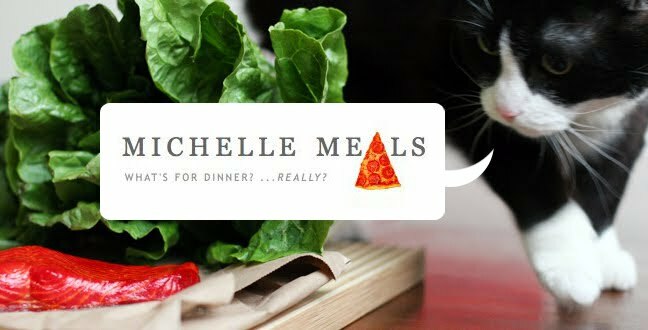 Michelle, never leave me (alone with a cucumber).